Thousands of GlaxoSmithKline (GSK) investors have asked to move their shares into anonymous holding accounts. An estimated 3,000 people have inquired about the switch, and 800 have now filed the paperwork to transfer their stakes, the drugs group confirmed. 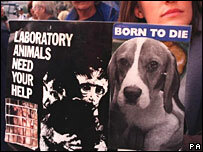 The move came after pressure from animal rights activists opposed to GSK's use of animal testing. Moving to a nominee account enables an investor to keep their name and address off publicly available registers. Earlier this month, animal rights extremists sent threatening letters to a number of GSK shareholders threatening to reveal their personal details if they failed to sell their stake in the firm. However, GSK later won an High Court injunction against the Campaign Against Huntingdon Life Sciences preventing them from revealing such information and from sending any more intimidating letters. A number of protests by animal rights campaigners have grabbed headlines in recent months. One intimidation campaign led to Huntingdon Life Sciences being delisted from the London Stock Exchange, while its US parent company had its launch on the New York Stock Exchange postponed last autumn. Last week, GSK chief JP Garnier insisted that threats from "extremists" would not drive Glaxo out of the UK.